First launched in April 2001, the Proton-M variant (a.k.a. 8K82KM) became the 21st century incarnation of the legendary Proton rocket. Until 2016, the vehicle underwent four incremental upgrades to improve its position in the increasingly competitive commercial launch market. The latest version of the Proton rocket, known as Phase IV, lifted off on June 9, 2016. 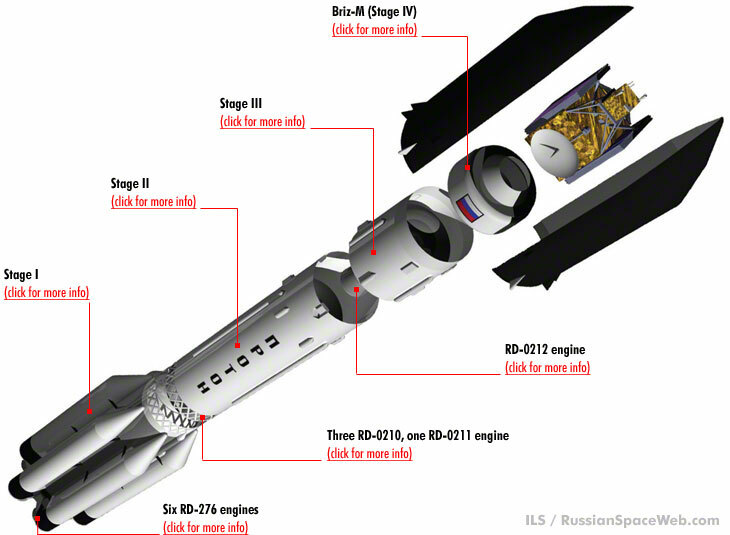 General architecture and key components of the Proton-M rocket. 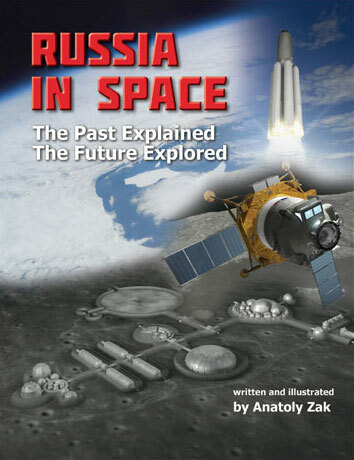 In 1993, in the midst of a painful transition from the Soviet system, the Russian space industry won a major victory on its way to a market economy. A London-based satellite operator, Inmarsat, became the first Western customer to buy a ride to geostationary orbit for its communications satellite on the Proton rocket. From that point, the Proton quickly became the commercial workhorse of the Russian space program. However just a few years after breaking into the international launch business, the Proton developers realized that their veteran money maker, whose design was largely frozen since the end of the 1960s, would need upgrades to keep up with the ever-increasing mass of high-end communications satellites. By the end of the 1990s, engineers focused on the development of a new digital flight control system, which would replace the Proton's obsolete analog system. The new computer made possible flexible flight algorithms, enabling the reduction of aerodynamic loads during the ascent through the atmosphere, increasing accuracy in reaching orbit and reducing the amount of unused propellant left in the rocket's propellant tanks. As a result, the payload could be increased. In addition to becoming more maneuverable during ascent, the rocket's flight program could be changed much more quickly. Finally, land areas below the rocket's flight path, which were reserved for empty stages, could now shrink, also thanks to a more accurate flight control. In parallel, an entirely new Briz-M space tug was under development, which would replace the existing Block-DM as the fourth stage of the rocket. This more compact upper stage would free additional volume under the rocket's payload fairing for potential cargo. The rocket became even more powerful, thanks to a new version of the RD-253 engines on its first stage, designated RD-276. Moscow's NPO Energomash propulsion company increased the thrust of the engine from 151 to 160 tons. With these two improvements, the Proton-M was able to deliver 22 tons of cargo into low Earth orbit, compared to 20.7 tons for the standard Proton-K booster. Several types of fairings (protective shrouds) were made available for the Proton-M rocket, depending on the size of the payload. 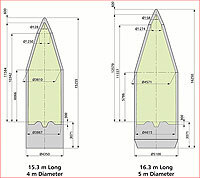 Commercial satellites are enclosed into a standard fairing with a diameter of 4.1 meters, exactly matching the diameter of the rocket's main body. It can accommodate satellites up to 3.87 meters wide. 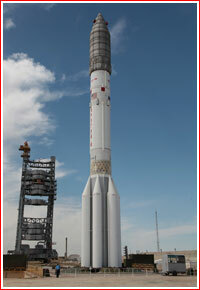 Like its predecessors, Proton-M rocket is built at GKNPTs Khrunichev in Moscow. The first-stage engines are manufactured in the city of Perm, while the second and third-stage propulsion systems are built in the city of Voronezh. The International Launch Services, ILS, a US-based subsidiary of GKNPTs Khrunichev markets the Proton-M rocket to commercial customers around the world. In addition to the popular geostationary transfer orbit used by communications satellites, ILS offers its customers to deliver single payloads or groups of satellites to a low-Earth orbit and to various medium-altitude orbits. In order to maximize payloads to geostationary orbits, the ILS missions also carried their satellites to so-called super-stationary transfer orbits, SSTO, from where satellites would actually descend to their operational altitude in geostationary orbit. The rocket was said to be able to support up to 12 launches a year, which it actually did in 2010. Originally planned to fly in 2000, the Proton-M/Briz-M vehicle made its successful inaugural flight in April 2001 and delivered its first commercial payload on Dec. 30, 2002. However even with all its upgrades, Proton-M still fell short by more than 600 kilograms of the original requirement from the Russian government to deliver 3.2 tons of payload directly to the geostationary orbit. Moreover, the expected emergence of Western commercial satellites exceeding five tons in mass, which needed to be dropped at the geostationary transfer orbit, would also leave Proton short on payload. To address the problem, various solutions were proposed, some of them very radical. 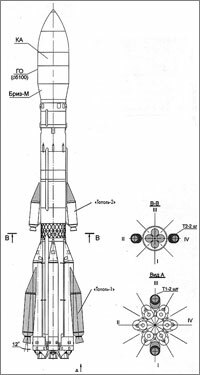 For example, solid propellant motors borrowed from the Soviet-era Topol missiles could be strapped to the sides of the first and second stage! At least two hydrogen-powered upper stages were also drafted. The Proton-M rocket upgraded with the KVRB fourth stage was promised to deliver 6.6 tons of payload to the geostationary transfer orbit and from 4 to 4.5 tons to the "proper" geostationary orbit. None of these ideas were ultimately accepted because of the major impact of such changes on the established production and pre-launch processing operations, as well as on the aerodynamic shape of the rocket. Such a radical change would require lengthy and costly validation in wind tunnels and in test flights. Moreover, it was required to do all the upgrades in parallel with the development of the new-generation Angara rocket, which was promised to replace Proton anyway. At the same time, the existing structure of the Proton-M rocket, which was inherited largely unchanged from the then 40-year-old original Proton-K, provided plenty of room for relatively easy and low-cost upgrades thanks to the introduction of new lighter materials. Some traditional metal components could also be lightened thanks to better understanding of strength requirements. In addition, the engine performance could still be improved, the propellant could be expended more efficiently and the aerodynamic shape of the payload fairing could be perfected to reduce atmospheric drag. 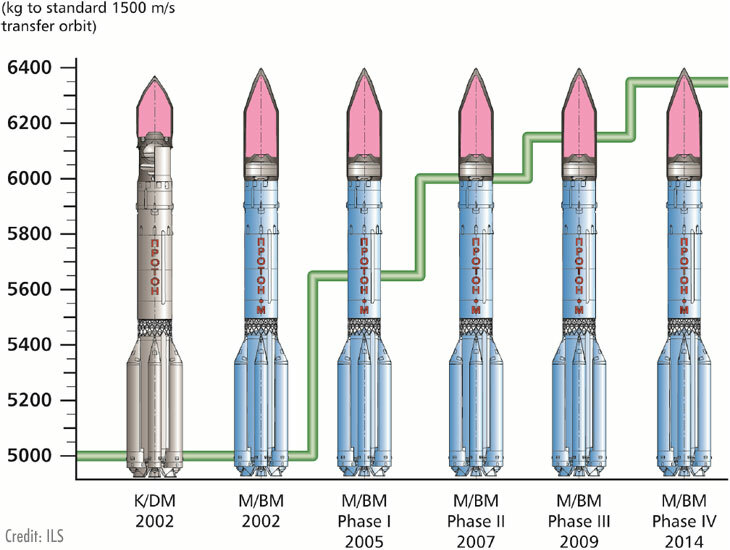 By 2003, KB Salyut, the development arm at GKNPTs Khrunichev, formulated a four-phase plan for incremental upgrades of the Proton-M rocket. (752) It would increase the rocket's payload to the geostationary orbit from 2.6 to 3.5 tons and the payload to the geostationary transfer orbit from 4.5 to 6.3 tons. A development timeline and payload capabilities for phased upgrades of the Proton-M rocket as of 2013. In the first step in the modernization of Proton-M, engineers selected upgrades, which would be easiest and cheapest in implementation. They were mostly limited to changes which could be made based on years of data collected from telemetry during actual launches and did not require structural changes. The structural changes were mostly focused on the Briz-M and the third stage of the rocket, because they promised the maximum effect. The first phase of upgrades increased the Proton-M's payload to the geostationary transfer orbit from 5 tons to 5.65 tons. Proton-M Phase I was first introduced in June 2004. The 5,580-kilogram Intelsat 10-02 became the largest commercial satellite carried by any Proton vehicle to date. The Proton-M Phase I upgrade flew its 16th and final mission in November 2008. The second phase of upgrades was designed to increase the payload to GTO to 6 tons. On the first stage, the engines were modified to enable a 112-percent increase in thrust, while propellant tanks were made thinner than standard. On the second stage, a composite structure replaced the standard stringer and beam body of the avionics bay. The structures forming the propellant tanks were also modified to reduce weight. On the third stage, composite materials also replaced traditional structures forming the tail section. Finally, the entire launch vehicle lacked its usual white paint, as a weight-saving measure. 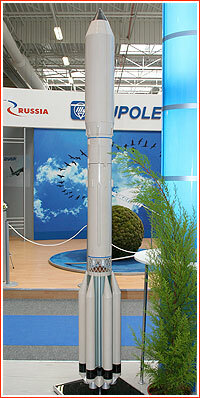 The Briz-M upper stage was also modified. The number of pressurization tanks located inside the avionics section and supplying the attitude control system was reduced from to six to two with an increased volume of 80 liters. The set of flight control avionics was moved to the center of the stage to reduce impact during the separation of the external tank. The external tank's structure was modified. Small vernier thrusters were also modified for higher performance. A Proton-M rocket with Phase II upgrades was first launched in July 2007, carrying the DirecTV-10 satellite. This variant made its eighth and last commercial mission in December 2010. The third phase of upgrades for Proton-M increased the payload delivered to the geostationary transfer orbit to 6.15 tons. 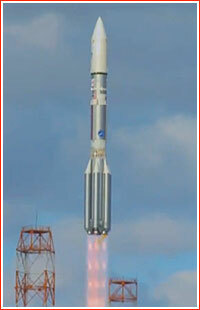 Phase III upgrades opened the capability to carry dual payloads developed by the Russian company ISS Reshetnev. The first test mission in February 2009, delivered Ekspress AM-44 and Ekspress MD-1 satellites. The first commercial mission was launched in March 2010, delivering the Echostar 14 satellite. With the fourth phase of upgrades, new materials, including carbon-based plastics and high-strength aluminum, were to be introduced into the Proton-M rocket to improve its structural design. In addition, the rocket's Briz-M upper stage was upgraded with a modified Pirit-RBs telemetry system, which along with a new modular design, also yielded five kilograms in mass savings. Phase IV was originally planned to be introduced at the end of 2013 and aimed to increase the rocket's payload to the geostationary transfer orbit to 6,350 kilograms. As of middle of 2015, the first launch of the Phase IV variant carrying Intelsat-31 satellite was penciled for the end of 2015 or beginning of 2016. The mission lifted off on June 9, 2016. The Proton-M is expected to remain in operation until at least 2025, by which time it should be slowly phased out and replaced by the Angara-5 rocket, based in Vostochny Cosmodrome. The Proton-M variant flew its 100th mission on Aug. 17, 2017, with the Blagovest No. 11L satellite.